It was on the heels of the 40th anniversary of Ntozake Shange’s for colored girls who have considered suicide/when the rainbow was enuf that I first heard Frank Ocean’s blonde. Actually, that is a lie: I first heard it in August at my cousins’ Philadelphia loft, while we conversed about our children and the education system, and whether Kanye West had four consecutively good albums. (We agreed yes.) Nonetheless, the difficulty in reviewing Ocean’s second album, the second offering usually being the awkward project in one’s discography, is precisely because I do not know what to say. At first, I thought about reading the album as a weekend: “Nikes”, “Ivy”, and “Pink+White” as the Friday and Saturday errands and festivities and interpersonal encounters you attend to before getting up for church on Sunday—the call to worship (“Be Yourself”); the choir processional on a churchified organ (“Solo”); the morning prayer (“Skyline To”); the first selection (Self Control); offering (“Good Guy”); the sermonic selection (“Nights”); the sermon by the pastor-elect, Rev. Andre 3000 (“Solo [Reprise]”); the call to discipleship (“Pretty Sweet”); the testimony and altar call (“Facebook Story”, “Close to You”); the church announcements (“White Ferrari”, “Seigfried”); and the benediction (“Godspeed”). “Futura Free” becomes the after-church meal with friends to contemplate the bittersweet reality of a new week, hoping this one is better than the last or remembering that Monday is a holiday. This review seemed facile. Then, based solely on the contingency of when I listened to blonde for comprehension, I thought about correlating the album to the saga of New York Fashion Week vis-à-vis Marc Jacobs and the politics of hair. In some ways, his comment about not criticizing “women of color for straightening their hair” has a subtext, I opine, that runs in line with the rhetoric of one bell hooks while a resident at the New School, both aesthetics having albeit different “desires”. I started pondering what it means for a black man with black hair to color his hair a “dominant” hue for capitalist consumption as self-promotion. This is with a full understanding that my own hair, not necessarily regarding coloring but rather styling, has allowed me to be a jack of all follicular trades. Likewise, it is not as if black men with blonde hair is novel (excuse the problematic website name considering this paragraph and the next). This seemed petty. For those who know what the “I” stands for under my pen name, they likely also know that the letters following that perpendicular pronoun are often misspelled. From as early as I can remember (and I have photos to prove it! ), this was my mistaken destiny as identity. That is why I could not help but be perplexed as to why Spotify has the album name, right in front of it, but chooses to misspell its title and typesetting. I wondered: maybe what the album means is nothing? If you are not willing to spell me how I spell me, how I conjure me, is capitalist consumption subverted insofar as how could anyone ever really consume the “me” projected as a lie? Blonde is and is not the album title, just like placing the “e” before the “a” in my name does not mean you mispronounce it, but that you have not been paying attention when I spelled it out. This also brings to mind Nathaniel Mackey: a new word, a new world—he literally takes the “l” for the win! Queering language is now on the table. 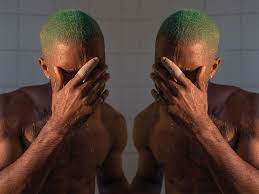 I am careful in suggesting that blond is queer in its affect, surmising why such a designation is boring, even while Frank wants to “be the boyfriend in your wet dreams tonight”. The lingering sentiment, however, is, as per Jonathan Jacob Moore’s poem and interview, whether you, Frank, “hate coming outside, sometimes, too”? To come outside—as Toni Morrison would state, to be “outdoors . . . the real terror of life”—is to encounter the facile, the petty, the essential. And as it concerns the environment, the sun can change the color of one’s hair. Therefore, one finds god in himself and he loves it/he loves it fearfully, inside, because the rainbow wasnt, and isnt, enuf to keep the head intact. Interiority allows one to willingly settle for a piece of sky as he generates in peace. Perhaps the album should be called 'Green'. I. Augustus Durham is a fourth-year doctoral candidate in English at Duke University. His work focuses on blackness, melancholy and genius.